At Sadler Sports and Recreation we keep our eye out for concussion-related news. We’re very careful to share well-researched information and not fan the flames of concussion hysteria. Our focus is reducing concussions during the course of play, not instilling fear of concussions. That being said, I recently learned of an innovative product currently being tested as a concussion prevention device. Dr. Gregory Myer of the Cincinnati Children’s Hospital Division of Sports Medicine is conducting tests on the Q-Collar, which controls blood flow to the athlete’s head. The Q-Collar approaches concussion prevention differently than helmets. A helmet can help reduce the force of impact. However, it can’t keep the brain from moving around within the skull, which the Q-collar appears to do. 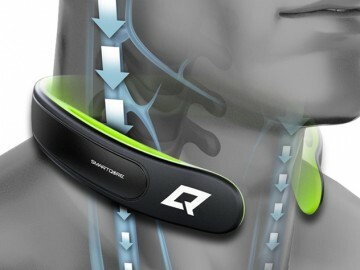 The c-shaped Q-Collar fits around the athlete’s neck, which exerts slight pressure on the jugular veins. These veins are the blood’s main pathway from the head back to the heart. The collar mildly increases blood volume in the cranium so the brain fits more snugly, reducing its ability to slosh about. In other words, the increased blood volume acts as an airbag for the brain. The most recent test participants are high school football players and female soccer players. Earlier tests included high school hockey players. The study results show a potential approach to protecting the brain from changes sustained during participants’ competitive seasons, according to Myer. He is continuing his research and data analyzation, but is optimistic that the device could be a game-changer in concussion prevention. Source: Elise Jesse. “New ‘collar’ being tested in Cincinnati could prevent concussions.” www.wlwt.com. 17 Aug.2017.